The next tuning package comes form the giant Brabus, who’s tweaked the performance a bit, and designed a cool body kit for it. Starting with the body, you get two BRABUS front spoiler lips that attach on the left and right side of the production apron and daytime running lights, BRABUS diffuser and the BRABUS rear spoiler on the trunk lid. Then there’s the interior where more individuality can be fulfilled by the BRABUS upholstery shop in the form of exclusive interiors crafted from especially soft and breathable BRABUS Mastik leather and Alcantara. 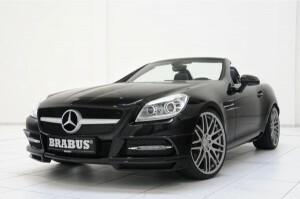 Brabus also provides one-piece or multi-piece designs wheels with diameters ranging from 17 to 20 inches. This wheels in this photo are BRABUS Monoblock F wheels painted the new exclusive ‘Liquid Titanium’ color. They are mounted in size 8.5Jx20 in front and in size 9.5Jx20 on the rear axle. BRABUS recommends high-performance tires from Continental, Pirelli or YOKOHAMA in sizes 235/30 ZR 20 on the front axle and 275/25 ZR 20 in back. BRABUS offers efficient and reasonably priced BRABUS ECO PowerXtra CGI tuning for the four-cylinder direct-injection engines. After the installation of the BRABUS ECO PowerXtra B20 CGI performance kit the four-cylinder direct-injection engine of the SLK 200 BlueEFFICIENCY produces an extra 26 hp (25 bhp) / 19 kW of power and an additional 30 Nm (22 lb-ft) of peak torque.